I received some products from Dove Men+Care for my husband to try out. He enjoyed them tremendously and he usually eschews body and facial care products that are more than just anything basic. These are more than just traditional products, they have charcoal in them, are scented with sandalwood etc. and are very nice. I smelled them and was very excited about them myself. Healthy skin begins with the right body and face wash. Men often want one wash to do both jobs. The best body washes balance power and comfort. They draw out dirt and leave skin renewed while hydrating to help prevent dryness. Dove Men+Care Minerals + Sage Body Wash, inspired by the elements, offers a complete clean and an energizing sense of freshness — without irritation. Specifically developed for men’s skin, Dove Men+Care Minerals + Sage Body Wash is formulated with Micromoisture technology. It’s clinically proven to help fight dryness better than regular men’s body wash, activates on skin, and rinses away easily. Infused with the power of nature, helps skin to look its best. This body wash provides a boost of freshness that leaves skin feeling renewed. Dove Men+Care Minerals + Sage Body Wash can be used every day to hydrate and nourish skin to help prevent dryness on both the body and face.Each use of the Minerals + Sage Body Wash delivers a boost of freshness for a clean, renewed feeling. The Sage body wash smells fresh and clean, like a forest. My husband loved how refreshing this body wash was. It was like feeling like he had been washed off in a forest. Dove Men+Care Charcoal + Clay Body Wash is infused with clay and charcoal and formulated with Micromoisture technology for skin that’s left feeling renewed and refreshed. With the effective Dove Men+Care formula, it provides thorough cleansing and a powerful boost of freshness. Specifically developed for men’s skin, Dove Men+Care Charcoal + Clay Body Wash uses Micromoisture technology to provide care. It activates on skin and is clinically proven to help fight skin dryness. Infused with Charcoal + Clay cleanses skin without irritation. It has a boost of energizing freshness. The body wash draws out and washes away dirt and oil from skin’s surface, because of the charcoal. It is clinically proven to help fight dryness. 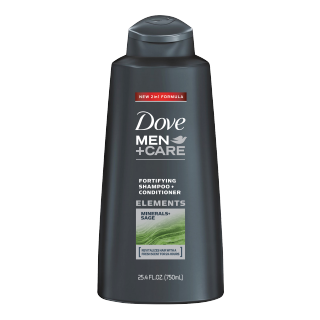 Dove Men+Care Charcoal + Clay Body Wash washes away day-to-day impurities while caring for skin. Inspired by clay soap and  charcoal soap, which have long been valued for their purifying properties and ability to draw out dirt and oil. This is perfect for those with oilier skin types. Sometimes, my husband has oily skin, this body and face wash is perfect for these occasions. It helps grab on to dirt and oil and take it away. Especially in the summer when it is hot. This body wash is great for summer. This shampoo and conditioner is revitalizing freshness at its best. It is specifically engineered to strengthen hair fibers. Hair is left visibly healthier and more resilient. This 2-in-1 shampoo for men gives a burst of fragrance for invigorated hair. Its a mineral shampoo engineered for men who want deeply clean hair with a refreshing effect. Its enriched with minerals and sage. Revitalizes hair with a fresh scent that lasts up to 24 hours. Enriched with minerals and sage, this men’s shampoo and conditioner is designed to leave hair deeply cleansed, visibly healthier and more resilient. This Dove formula delivers a burst of fresh, herbal fragrance that lasts up to 24 hours. It has 2-in-1 functionality. This sage shampoo cleans and conditions for stronger hair fibers and invigorated hair. My husband used this and absolutely loved it. His hair was stronger, fresher and more revitalized. It was also healthier and cleaner too. 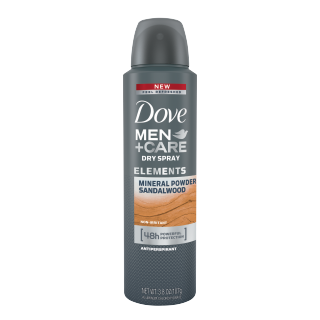 Dove Men+Care Mineral Powder + Sandalwood Dry Spray provides lasting protection with the essence of ingredients inspired by Earth’s elements. It combines the essence of sandalwood and mineral powder with a powerful antiperspirant, it’s clinically proven to control wetness for 48 hours. It goes on instantly dry.Formulated with ¼ moisturizer to protect skin, it delivers a lasting feeling of freshness. This is an antiperspirant spray for men that’s tough on sweat, not on skin. Engineered to provide 48-hour effective sweat + odor protection. Clinically proven non-irritating formula. Dove Men+Care Mineral Powder + Sandalwood Dry Spray provides 48-hours of antiperspirant protection. The best spray antiperspirant for men gives powerful protection without compromising comfort. This non-irritant formula protects skin and delivers an energizing, lasting freshness. My husband found this to be very nice. He liked this spray because it went on instantly dry. And it delivers 48 hours of protection, so you can skip a day and still feel protected. For a man, that is a minor miracle. An antiperspirant that is tough on sweat, not on skin. Feel refreshed with Dove Men+Care Mineral Powder + Sandalwood Antiperspirant Stick. Mineral powder and sandalwood: two elements known for their abilities to absorb moisture and calm the skin. Inspired by these elements, this antiperspirant for men has a refreshing formula that delivers a boost of freshness and 48 hours of powerful protection against sweat and odor. Designed specifically for men, this Dove Men+Care antiperspirant is clinically proven to control wetness. Combining the essence of Mineral Powder + Sandalwood for a boost of freshness with each use, Dove Men+Care antiperspirant offers protection that's tough on sweat, not skin. It has a Clinically proven non-irritating formula. Provides a boost of freshness that leaves underarms feeling refreshed. ¼ moisturizer technology protects skin. Dove Men+Care Mineral Powder + Sandalwood Antiperspirant Stick provides 48 hours of antiperspirant protection. Powerful antiperspirant, non-irritant formula – choose this antiperspirant stick to control wetness and protect your skin with ¼ moisturizer technology. This antiperspirant stick is so powerful you can skip a day if you need to. My husband likes this one a lot and he loves the sandalwood scent. Dove Men+Care Mineral Powder + Sandalwood Deodorant Stick provides 48 hours of constant protection and uses ¼ moisturizer technology to protect the skin. Designed for men, this deodorant stick combines the essence of mineral powder and sandalwood for a boost of lasting freshness. 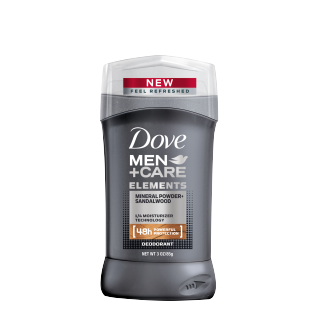 Dove Men+Care Mineral Powder + Sandalwood Deodorant Stick is a strong, durable men’s deodorant stick that’s tough on odor, not on your skin. Choosing Dove Men+Care Mineral Powder + Sandalwood Deodorant Stick means choosing powerful protection against odor, but not having to choose between strength and comfort. Tough on odor, not on skin. Engineered to provide 48-hour effective odor protection. ¼ moisturizer technology strengthens skin against irritation. Inspired by Earth’s elements minerals powder + sandalwood. Provides a boost of freshness that leaves underarms feeling refreshed. Easy to apply men’s deodorant stick. Dove Men+Care Mineral Powder + Sandalwood Deodorant Stick provides 48 hours of powerful protection against odor.Dove Men+Care Mineral Powder + Sandalwood Deodorant Stick helps to protect the skin with ¼ moisturizer technology. My husband prefers the antiperspirant stick to the deodorant stick but he likes the sandalwood scent both. He says the antiperspirant stick performs better. It provides 48 hours of protection and lasts for long enough that you can skip a day if you need to. Dove Men+Care Minerals + Sage Antiperspirant for men mixes has the essence of minerals and sage for an energizing lasting freshness. Formulated to control wetness for 48 hours without irritation, it’s tough on sweat, not on skin. Feel refreshed with Dove Men+Care Minerals + Sage Antiperspirant Stick. Drawing inspiration from the Earth’s elements, the clinically proven Dove Men+Care men’s antiperspirant formula provides powerful protection against sweat and odor, while protecting your skin. Antiperspirant that is tough on sweat, not on skin. Engineered to provide 48-hour effective sweat + odor protection. ¼ moisturizer technology strengthens skin against irritation. Inspired by Earth’s elements minerals + sage. Clinically proven non-irritating formula. Dove Men+Care Minerals + Sage Antiperspirant Stick provides 48 hours of powerful antiperspirant protection against sweat and odor. 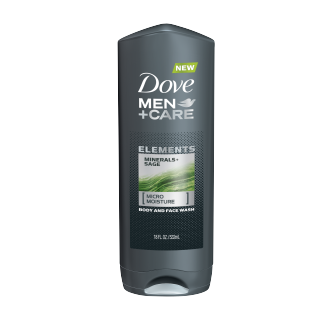 Dove Men+Care Minerals + Sage Antiperspirant Stick keeps underarms dry while protecting skin with ¼ moisturizer technology. My husband liked this one because it made him feel fresh. And he likes that it holds back perspiration for 48 hours. He can even skip a day. He loves the scent too, as it reminds him of a forest. 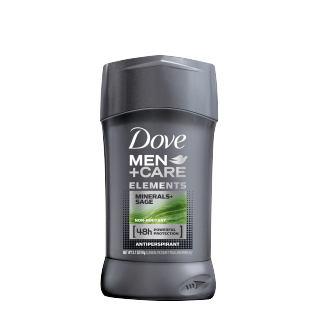 Dove Men+Care Minerals + Sage Deodorant Stick combines the essence of Earth’s elements with the clinically tested Dove Men+Care formula – proven to effectively prevent odor. Combining the essence of minerals and sage, this deodorant stick for men prevents odor for 48 hours. Plus, ¼ moisturizer technology gives your underarm skin the protection it needs. The Minerals + Sage Deodorant Stick infuses the essence of Earth’s elements; minerals and sage for freshness to match its power of protection. It’s a men’s deodorant stick that’s tough on odor, not on skin. Engineered to provide 48-hour effective odor protection. ¼ moisturizer technology helps to protect the skin. Men’s deodorant stick infused with the essence of minerals + sage. Provides a boost of freshness leaving underarms feeling refreshed. Dove Men+Care Minerals + Sage Deodorant for men is clinically proven to provide 48 hours of odor protection. Dove Men+Care Minerals + Sage Deodorant Stick helps to protect the skin with ¼ moisturizer technology. My husband prefers the antiperspirant deodorant stick to this one. This way it helps prevent perspiration too. This stick only prevents odor. If that is what you want, this is perfect for you, it will prevent odor for 48 hours. You can skip a day too. It works great. All of the Dove Men+Care products are available at mass market retailers nationwide such as Walgreens, Rite-Aid, CVS, Target and WalMart. They are even available on www.dove.com and www.amazon.com. Like Dove on Facebook: https://www.facebook.com/DoveUS/?brand_redir=21435141328; Follow Dove on Twitter:@dove; Follow Dove on Instagram:https://www.instagram.com/dove/?hl=en and Subscribe to Dove on YouTube:https://www.youtube.com/user/doveunitedstates.